It's the season of giving, and in that vein Facebook has announced it's launching a way for users to donate to select nonprofits, all the while collecting more of your info. The feature is called Donate, and through a new "Donate Now" button the social network's one-billion-plus members can give to groups such as UNICEF, Girls Inc., Oxfam America and the World Wildlife Fund. 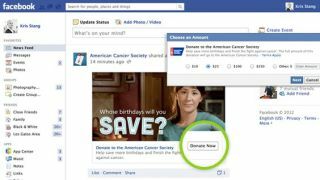 Donate will pop up next to News Feed posts and at the top of groups' Facebook pages. Clicking Donate Now lets users enter a donation amount, input their payment info and send the monetary gift then and there. They can also share the nonprofits' posts with their friends, expanding the umbrella of do-gooding-ness ever further. There are 19 participating nonprofts for now, but Facebook said it plans to expand the program soon. It's a seemingly altruistic addition by Facebook, one that should earn deserving organizations plenty of much needed dinero. However, there's a silver lining in it for Facebook in that Donate also nets users' billing information. Perhaps more motivated by the spirit of giving than of buying, users may find themselves more willing to type in their payment information, turning it over to the social network for digitized keeping. Later, the same info could be easy-filled when making purchases on Facebook from for-profit companies. Mark Zuckerber's firm has also recently started offering a feature called Autofill With Facebook, a button that third-party mobile apps can utilize at the point of checkout to populate billing and shipping information with minimal typing. Facebook doesn't earn a fee from Autofill, however it can tap its data to show businesses how effective their ads are. With credit card info perhaps more readily inputted thanks to Donate, getting more folks to punch the Autofill could be part of Facebook's designs. As TechCrunch pointed out, users can delete their credit card information after making a donation through their payment account settings, but it's an extra step in the process and one that's not readily obvious. We don't want to sound overly cynical as really, who can argue with donating to help save endangered animals, but just know Facebook should see ample benefits too. Google Glass isn't the only wearable check you can plaster on your peepers.